Kicking off the grandest of all sports sponsorships required a truly Olympian-scale meeting. 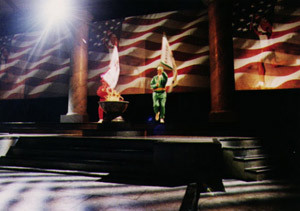 TGIF created a total surround environment recreation of the stadium at Olympia, Greece and proceeded to have the sales teams enter as if they were the real participants on this unique world stage. With spectacularly big multi-image and video projections, the environment also became a perfect canvas for displaying the elements that would support the entire sponsorship. 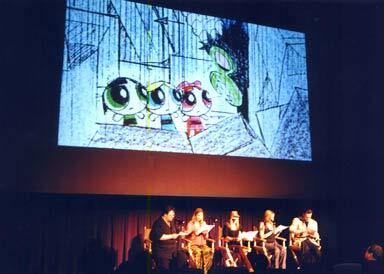 "The Powder Puff Girls" presentation at the L.A. Roadshow provided a unique opportunity for brand and marketing managers all across the country to see behind the scenes in the creation of a "kids' favorite" cartoon. TGIF took the storyboards for a sequence from a new Powder Puff Girls movie and created an animatic show that was then presented on the big screen at Loews Cinema at Universal CityWalk as the actual voice actors read their lines. This Mars Sales Meeting theme was conceived at a time when much was in transition within the Mars companies. Realignments, rebranding, new channels, redeployment all meant that the sales force neede to understand what was happening, what it all meant and what their role would be in the process of reaching that bolder vision.